The Alzheimer's Association on Maui offers free services, education and support to people with living with Alzheimer's disease or other related dementias and their families and caregivers. We offer educational workshops year round, hold support group meetings and work with medical professionals on training staff and patients. In addition to this, we fundraise to support these efforts and contribute to research efforts. 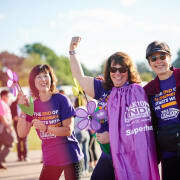 Our two signature events on are the Walk to End Alzheimer's (Oct 26) and The Longest Day (ongoing until June 21). We are currently hoping to find volunteers to support our local and national efforts in outreach, communication education, and for our signature events.